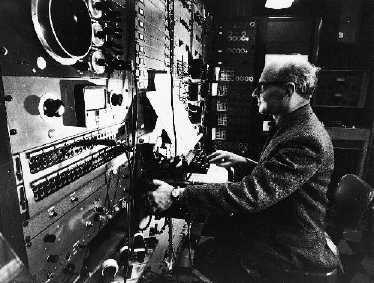 Milton Babbitt was one of the most influential teachers and composers in the United States during the latter half of the twentieth century. While he studied music as a youngster, after his graduation from high school in 1931 at the age of fifteen he entered the University of Pennsylvania to study mathematics. He soon transferred to New York University to study music, studying the works of Stravinsky and Varèse. He also studied the dodecaphonic works of Schoenberg, Webern, and Berg, who at the time were little-known in the United States. Babbitt did graduate work in music at Princeton, studying with Roger Sessions. In 1938 Sessions, having been asked by Princeton to form a graduate department of music, appointed Babbitt as instructor of music. During World War II Babbitt taught mathematics at Princeton and worked as a mathematician for the US government. Following the war he composed music for film and Broadway, returning to Princeton in 1948. From the 1940s onward, his primary interest was in serialism. He considered Schoenberg's music one of the great intellectual achievements of the first half of the twentieth century, stating that had it not been for Schoenberg, he would probably have gone into mathematics. While similar operations were being carried out in Europe by composers such as Stockhausen and Boulez, Babbitt, the mathematician, advanced the level of consideration by subjecting the matrix to more abstract set theory mathematics. He became the father of a generation of composers schooled in matrix arithmetic and serial operations. With his background as a mathematician, he popularized the illustration of serial row operations with a matrix that showed all transpositions, inversions and retrograde versions of a row in a 12x12 square. By creating the matrix with numbers instead of pitch names, he enabled mathematical matrix operations to govern his compositional practices. Babbitt advanced the nature of row operations, such as choosing rows based on interior symmetries (three groups of four equivalent intervals, for example). His pieces were based on total serialism, in which there were rows for duration, timbre, duration, loudness, and so on. All were equally important as pitch, and all were predetermined by their placement within a matrix. Composing on the Mark II is a time consuming business. When everything is going right, when I know exactly what I want and the equipment is working properly, and if I'm lucky, I can get one minute of music out of six or seven hours with the machine. Most times it takes much longer. In the same interview, he countered the criticism that machine-assisted music sounded "inhuman" by claiming that, in fact, no music was more human since the composer had the ability and responsibility to attend to every detail of the music. This of course is counter to what most people would consider the meaning of "human in music," which more often refers to random aspects that are not consciously arrived at. Why should the layman be other than bored and puzzled by what he is unable to understand, music or anything else?...Why refuse to recognize the possibility that contemporary music has reached a stage long since attained by other forms of activity? The time has passed when the normally well-educated [person] without special preparation could understand the most advanced work in, for example, mathematics, philosophy, and physics. Advanced music, to the extent that it reflects the knowledge and originality of the informed composer, scarcely can be expected to appear more intelligible than these arts and sciences to the person whose musical education usually has been even less extensive than his background in other fields. But how, it may be asked, will this serve to secure the means of survival for the composer and his music? One answer is that, after all, such a private life is what the university provides the scholar and the scientist. It is only proper that the university which--significantly--has provided so many contemporary composers with their professional training and general education, should provide a home for the 'complex,' 'difficult,' and 'problematical' in music.